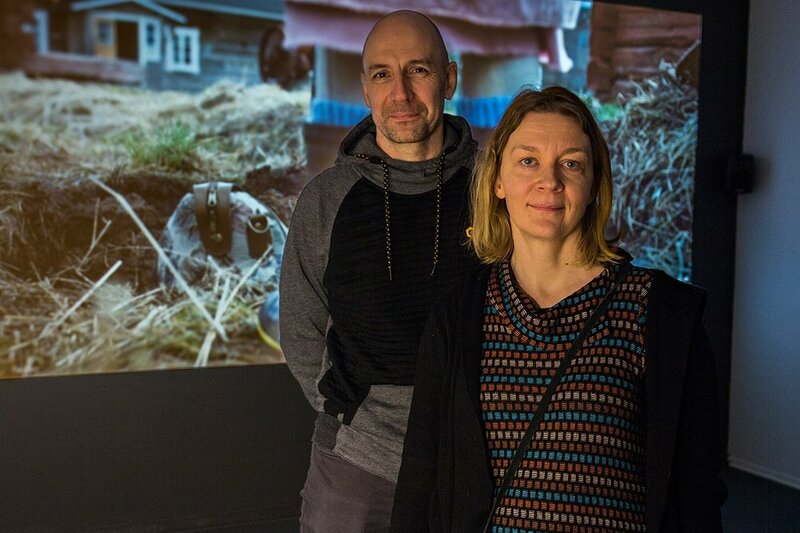 Rainio & Roberts awarded 8th Turku Biennial prize for "They Came in Crowded Boats and Trains"
Added on February 20, 2018 by Mark Roberts. The Turku Biennial Prize is awarded to Minna Rainio and Mark Roberts. They are currently taking part in the 8th Turku Biennial with the short lm They Came in Crowded Boats and Trains. The artists will be awarded with a prize of €5.000 by the Aboa Vetus & Ars Nova Museum. The prize winner was selected by Riitta Monto, editor-in-chief of Turun Sanomat. Her statement about her choice: They Came in Crowded Boats and Trains by Minna Rainio and Mark Roberts is a visually powerful and humane work. The 18-minute short film focuses in an interesting way on Finnish recent history on two levels, drawing a parallel between the events in autumn 2015 and autumn 1944. In 2015, more than 20,000 Iraqi asylum seekers crossed the border between Finland and Sweden in the town of Tornio. The lm starts as if documenting the migration of the silent travelers across a di cult terrain and a landscape that is at times dismal. The presumption and interpretation of the viewer is taken to a new level when it is revealed that the Iraqi asylum seekers in the video are not performing as themselves. Instead, they demonstrate the journeys of Finnish evacuees in the autumn of 1944, when an order of evacuation took more than 55.000 people to safety, across the border to Sweden. More than double the number of Finns crossed the border then, compared to the number of asylum seekers that arrived in Finland in 2015. The tension of Rainio’s and Roberts’ script keeps its grip until the end. The conscious arrangement of the scenes works all through the lm. A small gem in the story is an opinion: “To be honest, the food is not so good.” Before the viewer gets too excited about the ingratitude of the person receiving help, it turns out that the opinion belongs to a Finnish evacuee, commenting on the Swedish food that is too sweet to his taste. The work brings through art a deeply humane viewpoint to the current societal discussion. Minna Rainio (b. 1974) and Mark Roberts (b. 1970) are a Helsinki based artist duo. Their video works and moving-image installations investigate the impact of social and political power on individual experiences. Their work is heavily based on research, resulting in works that have their roots in documentary material. Their works have been exhibited in several exhibitions in Finland and elsewhere. They Came in Crowded Boats and Trains was produced by Flatlight Creative House with Maria Gullsten as producer and Ilmari Mannermaa as director of photography.